Shaver Transportation Company was founded as a family-owned business by George W. Shaver in 1880. The Shaver family continues hands-on management and ownership of the business today. Harry Shaver is Chairman of the Board. His son, Captain Steve Shaver now serves as President of the company. Steve and his sister, Samantha Shaver, are both Board Members. Together with our employees, Shaver has grown into a regional tug and barge company with a fleet of thirteen tugs and eighteen barges. We focus our efforts on three lines of business: ship assist, inland grain and bulk commodity transportation and harbor/marine services. Shaver is founded on the basic principles of quality, reliability, experience, service and safety. We are dedicated to the protection of human life and environmental responsibility. Our reputation for success is built on operating a powerful fleet with experienced employees. Our depth of experience gives us unique knowledge to help with our customers’ needs. Shaver continues to reinvest in our company to stay focused on the future needs of our customers and the growth of the Columbia Snake River System. For five generations our family has provided innovative and money-saving service in the world-wide maritime community. Like the Shaver family, our reliable employees are committed to long-term service with Shaver. Together, we share a philosophy and tradition of providing responsive service, new ideas, and better equipment to meet your needs. We thank our valued customers and employees who continue to make us strong and successful. We look forward to collaborating with our customers, vendors and partners to make a difference in shipping and barging for generations to come. Our tug, the wooden-hulled Henderson, was used in the film Bend of the River in 1952. 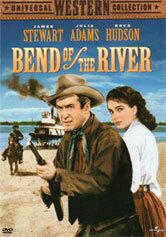 The film, starring Jimmy Stewart and Rock Hudson, was filmed on the Columbia River. Photo provided by Universal Pictures.